It’s the same old story. We have seen it before in the privatization of the National Power Corp. (Napocor) where consumers are now being forced to pay more to shoulder stranded costs arising from sweetheart deals with private power generators. 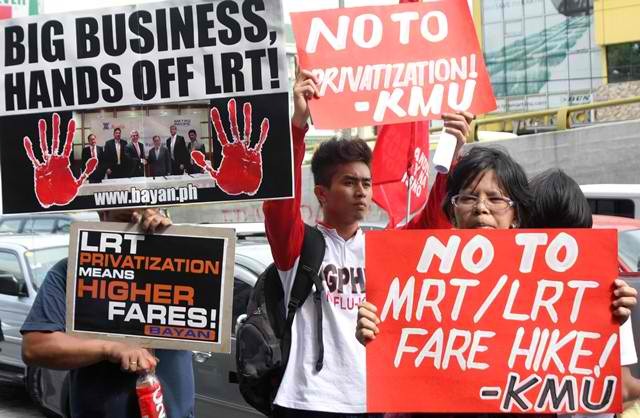 We have seen it in the privatization of the MRT where government has been insisting to hike fares to pay for financial obligations arising from guaranteed profits and debt payments. Both punish the public with exorbitant fees and drain the already scant resources of government. The same fate awaits the Filipino people if the P60-billion privatization and line extension of LRT 1, the largest public-private partnership (PPP) project of President Benigno Aquino III to date, will not be stopped. Those who are interested to look into the details of the LRT 1 privatization may download a copy of the draft 32-year concession agreement here. Scrutinizing the draft contract, we will see that despite the repeated denial by its officials, the Aquino administration will continue the usual practice of providing state guarantees to peddle its privatization program. And as you might expect, such guarantees will come at the great expense of the public. If the private operators of the MRT were granted with a guaranteed 15% return on investment (ROI) annually, the winning bidder for the LRT 1 privatization will enjoy a so-called top-up subsidy. The Department of Transportation and Communications (DOTC), the agency in charge of LRT 1 privatization, explained that the top-up provision will entail the government to shoulder the difference between the pre-approved fares contained in the concession deal and the actual fares that authorities will be able to actually implement. This is essentially a profit guarantee for the private operator and can be found in Section 20 (on Concessionaire Revenues) of the draft concession agreement for LRT 1 privatization. Under the draft contract, the concessionaire will be entitled to a notional fare (Section 20.3.a) that shall be agreed upon by the government and the winning bidder to ensure the commercial profitability of the system. The notional fare would be periodically adjusted (read: increased) during the entire 32-year concession period. Section 20.4.a of the draft contract, meanwhile, states that: “In any period, where the Approved Fare is lower than the Notional Fare, the Grantors shall pay to the Concessionaire a Deficit Payment (“DP”), to reflect the difference between the Notional Fare (NF) and the Approved Fare (AF).” The Grantors refer to the DOTC and the Light Rail Transit Authority (LRTA). Concretely, this means that if the DOTC or LRTA could not implement a certain fare level for LRT 1 as committed in the concession agreement due to strong public opposition and/or regulatory, legislative or judicial intervention, government is obliged to pay the private operator its expected revenues from such fare level. Government, of course, will be using public money. In other words, the public will not escape the greed of the private operator – whether as LRT 1 commuters (who will shoulder the fare hike) or as taxpayers (who will bear the top-up subsidy). Needless to say, prospective LRT 1 operators that include San Miguel Corp. Infra Resources, Inc.; Light Rail Manila Consortium of Manny V. Pangilinan and the Ayala group; DMCI Holdings, Inc. of the Consunji group; and the foreign consortium MTD-Samsung of Malaysia and South Korea are pleased with the deal that they will be competing to secure from the Aquino administration. While providing profit guarantees is standard practice in privatization, the regulatory risk guarantee is unique to the Aquino administration. His economic managers designed the scheme so as to avoid criticisms that he is repeating the same disadvantageous perks given to PPP investors in the past that caused the financial bleeding of government such as in the case of Napocor and MRT. But the top-up subsidy or regulatory risk guarantee is essentially the same as the take-or-pay provisions in previous PPP deals. Government and the end-users will still assume all the risks associated with operating the infrastructure while the profits of the private operator are secured. Where will government get the funds for the LRT 1’s top-up subsidy? To be sure, it will not come from disposable funds or public savings as the national budget deficit is still huge at P127.3 billion while the national government remains heavily indebted with more than P5.38 trillion in outstanding debt as of November 2012. Like his predecessors, Aquino will borrow more to finance his PPP program including the profit guarantee for participating private corporations. The National Economic and Development Authority (Neda) had earlier announced that government will tap multilateral institutions to provide for the guarantees so that when PPP investors face risk, they can still “be paid fast and immediately”. One of the multilateral lenders that made a pledge to fund the government guarantees on PPP projects was the World Bank which issued the commitment during the 2010 PPP Summit. Incidentally, the World Bank through its investment arm International Finance Corp. (IFC) is the transaction advisor of the DOTC and LRTA in the LRT 1 privatization. Aside from the direct financial burden that will hit the people, the regulatory risk guarantee will also further undermine the already weak system of supposed check and balance through the use of regulatory authorities, courts or Congress as a venue to protect public interest. For example, to prevent the implementation of an LRT fare hike, the people may seek relief from the Supreme Court (SC) through a temporary restraining order (TRO). The DOTC and LRTA would then be prevented from implementing the fare increase. However, the private LRT 1 operator could still collect the revenues from the fare hike through government-guaranteed Deficit Payments thus effectively negating the intervention of the High Court. The regulatory risk guarantee was designed precisely to protect the commercial interests of the private business undertaking PPP projects from such outside intervention. Economic managers behind the regulatory risk guarantee have cited the case of the South Luzon Tollway Corp. (SLTC), the private operator of the South Luzon Expressway (Slex), which the SC stopped in August 2010 from implementing a more than 250% toll hike already approved by the Toll Regulatory Board (TRB). Bayan Muna party-list congressman Teddy Casiño also filed a House resolution seeking for a suspension of the toll increase pending a legislative inquiry. In reality, while DOTC officials try to differentiate the LRT 1 privatization’s top-up subsidy from the controversial guaranteed ROI present in earlier PPP projects, it appears that the former is even more favorable to the private concessionaire (and therefore more disadvantageous to the public) than the latter. The 250% Slex toll hike, for instance, arose from the guaranteed 17% ROI for SLTC contained in its 2006 Supplemental Toll Operation Agreement (STOA) with the TRB. But such guaranteed ROI became meaningless when the SC issued its TRO (although eventually lifted after more than two months). With the top-up subsidy, such risk of fewer profits due to an SC TRO or any outside intervention is eliminated. The development and lease of commercial spaces on LRT 1 stations and depot as well as revenues from advertising could be a potential source of income for government that could be maximized instead of resorting to steep fare hikes and/or privatization. The country’s LRT and MRT system has very low non-rail revenues which include earnings from commercial development and advertising. According to a 2007 study by the Japan Bank for International Cooperation (JBIC) cited by Senator Francis Escudero, the non-rail revenues of the LRT is equivalent to a paltry 2.6% of total revenues while neighboring countries get more than 20% from advertising and commercial leases. Clearly, there is much room to generate more revenues from commercial development for government if it will retain the LRT 1. Unfortunately, such potential source of income will also be transferred to a private business under privatization. The Philippines is among the first Third World countries to implement massive privatization of infrastructure development and operation. Early efforts were set off by conditionalities attached to loans from the World Bank, International Monetary Fund (IMF) and the Asian Development Bank (ADB) in the 1980s and 1990s. Among the big-ticket items already privatized are the Napocor assets, the Metropolitan Waterworks and Sewerage System (MWSS), the MRT, super highways like Slex, etc. Through the years, the people have been subjected to soaring and exorbitant user fees charged by the private concessionaires. Meanwhile government debt and deficit continued to balloon ironically due to, among others, privatization deals that were pursued supposedly to ease the fiscal pressure on public coffers. Unfortunately, the Aquino administration’s PPP program will continue the long discredited and proven flawed policy of privatization such as its ongoing efforts to privatize LRT 1. Government could not even find a compelling justification to push for LRT 1 privatization. Unlike the heavily indebted Napocor and MWSS, for example, the LRTA – government operator of the LRT system – is at least generating enough revenues to finance its operation and maintenance (O&M) requirements. In 2012, the LRT 1’s gross revenues even increased by almost 10% while its farebox ratio – the proportion of fare revenues to total O&M expenses – improved from 1.10 in 2011 to 1.31 last year. A farebox ratio of 1.0 means that fare revenues can cover 100% of O&M costs. Certainly, improving, modernizing and extending the system to Bacoor, Cavite would require additional investments and this is where the national government should step in by generating the needed funds. Aquino could not argue that the government does not have the finances to make such investment thus the need for privatization. But if government is willing to incur more debts and guarantee the profits of whoever will win the LRT 1 project, why can’t it make the necessary investments such as through bilateral loans under concessional terms? When Malacañang was insisting on increasing the fares for LRT and MRT, its core argument was that government could no longer supposedly subsidize the system. Yet it is willing to subsidize the profits of the LRT 1 operator? → Sabah crisis: Is Aquino siding with Malaysia to protect relatives’ business interests?